On the evidence of their election manifesto, universities make Theresa May’s Conservatives uneasy. Something about the modern university worries the authors of this document, as they pick away at higher education policy in one section after another. While Labour’s manifesto mentions universities only in relation to fees, it feels like there’s a lot more at stake for the Tories. So I’d like to consider what’s troubling them, and also what they propose instead, by dwelling on some of the manifesto’s language. The curious thing about this sentence is not the commitment – hugely disappointing though it is – but the justification. What does it mean? In technical terms, David Morris identifies two alternatives: ‘standards of visa compliance or standards of quality in higher education’. It’s also effectively meaningless; who’s asking for lower standards, of anything? But there’s perhaps something more fundamental, even philosophical at work here as well. It’s an anxious sentence. It has the tone of a head-teacher fretting that her pupils’ are being distracted by the latest social media fad. British universities are accustomed to working in a global higher education network. Their ideal would be a world with frictionless movement of students, researchers and ideas. Mass movement of students is a good thing for the exporting country since it raises skill levels, and for the importing country since it generates income. And we talk about a ‘fourth age of research’, in which international collaboration makes our work more effective and visible. But that’s not the way this manifesto sees the world. It wants the UK to be special, even as it struggles to put its finger on how. This is a document, after all, that positions the UK as a ‘champion of free trade’: using a metaphor from medieval chivalry to position a former colonial power as distinctive in endorsing a value that might otherwise appear to be all about international equality. So ‘maintaining standards’, I’d suggest, is about having a little bit of globalization while maintaining British universities as a little bit insular. It is of a piece with the ongoing commitment to ensuring that international students return home after graduating, and that they pay more money towards the cost of the National Health Service. It says: you can be here, but just don’t affect us in any discernible way. In practical terms, one might ask: why on earth would they want to rip this hornets’ nest right off the branch, immediately after passing the Higher Education and Research Bill? The commitment is made in the context of a vision of a revived ‘technical’ education sector, yet it’s another statement that betrays more fundamental anxieties about the university. There was a moment, not so very long ago, when vice-chancellors fantasized about freedom from state control. The state, it was said, was an unreliable partner. The fees settlement meant that primary educational contracts were now between students and providers, while research councils and independent funding bodies further served to keep the state at arm’s length. But this election’s Tories don’t like this. Moving higher education into the Department for Education was symbolically important in this regard, indicating a perception that universities are fundamentally not independent businesses but part of a national educational system. This manifesto is a record of their scrabbling around in the dark looking for new levers to pull. Hence that ‘major review of funding’. Maybe differential fees according to an institution’s graduates’ record of repayment? Who knows? Maybe they don’t know themselves. It might never happen. But it’s important as a statement of authority: the state is in charge. Universities argue that global recognition and local influence are symbiotic. This is powerfully stated in University College London’s strapline: ‘London’s global university’. But the Tories – the declared party of the ‘somewheres’, sceptical of the ‘citizens of the world – are suspicious. Hence the free schools and academies. They also want to ensure that universities create ‘opportunities for local people, especially those from ordinary working backgrounds’ – frankly, the HE equivalent of a commitment to the family. But there’s more: new technical colleges will be linked with ‘leading’ universities (a phrase that, as Andrew McGettigan has noted, might leave the ‘non-leading’ post-92s feeling painted into a corner – most likely the Tories envisage some repurposing); and the relocation of government departments and agencies, which will supposedly create further opportunities for local development. 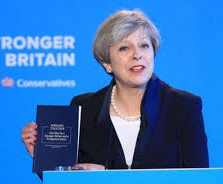 The Conservative Party manifesto moulds an idea of the university from the clay of British nationalism. It’s a university of ‘high standards’ and Nobel laureates, recognized in global league tables while maintaining an arm’s-length approach to the messy business of globalization. It’s a university that can be turned to address government priorities, from battery technology research to training more doctors, at the flick of a policy switch. At one moment the manifesto declares a commitment to ‘enable top scientists to work here’. While perfectly in accord with its idea of the university, this statement is telling in its assumption that top scientists will actually want to buy into the Tories’ insular, containable, malleable model of a British university. They – like international students, like existing academics in UK universities, indeed like all those other potential migrants scuttling their way through the netherworld of Tory policy – may very well decide to go elsewhere. * A version of this piece (ruthlessly stripped of some of its best lines) was published by The Guardian HE blog.